On July 13, 1892, 10 New Hampshire bankers met at the Parker House in Boston. After discussion and a unanimous vote, the New Hampshire Bankers Association elected its first president, George Byron Chandler of Amoskeag National Bank in Manchester, N.H. Just a few months later, on September 7, 1892, the group reconvened at the Parker House and adopted its constitution and bylaws (see image). As the association celebrated its 125-year milestone last year, we reflected often on the founding documents of the organization, including the NH Bankers’ original mission statement. The founders believed that the association was needed to “promote the general welfare and usefulness of banks and banking institutions, and to secure uniformity of action, together.” And although more than a century has passed since these original words were written, the underlying sentiment remains the same today. New Hampshire bankers are committed to these same goals, simply carried out in new and innovative ways. Among the many observations one could make in reviewing the life of the association is the strong partnership that has always existed between NH Bankers and the American Bankers Association. Many of the pivotal points in our own story are closely linked with those of our partners in Washington. Collaboration in advocacy, education and member services has been a tradition that dates back to the founding of the association. Our 125th anniversary celebration brought bankers from across the generations together to celebrate at an event this past November. It was a convergence of the bankers from yesterday with the bankers of tomorrow, all joining together to celebrate the past accomplishments in New Hampshire’s banking industry and look ahead to what the future has in store. That evening was a culmination of a significant historical preservation effort that began with a decision of the NH Bankers’ board in June 2017. Bankers and staff from many generations volunteered to dive into hundreds of pages of history stored in boxes in an office closet. Through the process, we were able to successfully identify important milestones in the history of New Hampshire’s banks. Faces of bankers from throughout our history were identified to help us preserve our understanding of who we are and where we came from. The NH Bankers’ board engaged a local videographer to capture the association’s story through interviews and images. The resulting video provided a look back and ahead, with the help of a handful of bankers who shared their own connections with NH Bankers. One highlight of this anniversary project is our partnership with the New Hampshire Historical Society. The association is working with the society to preserve and restore documents dating back to the founding of NH Bankers. The association gifted its archives to the society to enable future generations to access this important history. 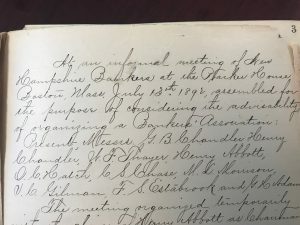 In addition to the preservation of the archives, the board chose to fund the digitization of NH Bankers’ historic documents, providing ongoing access to bankers, students, researchers and other interested parties for years to come. While going through the process, we knew each and every bank in the state would have their own story to tell—all of which were closely linked to our own story. We were sure that many banks may have documents or photographs not just from their own institution, but from institutions that no longer exist. We hope this project inspires other banks to join us and find a home for those items, so that we can continue celebrating the long and storied history of America’s banks for years to come. Christiana Thornton is president and CEO of the New Hampshire Bankers Association. Learn more about NHBA’s 125th anniversary at nhbankers.com. For resources on commemorating a landmark anniversary, visit aba.com/SpecialEvents.